This is my first Black Forest Cake experience and ummm hello, lets just say that it will not be my last. 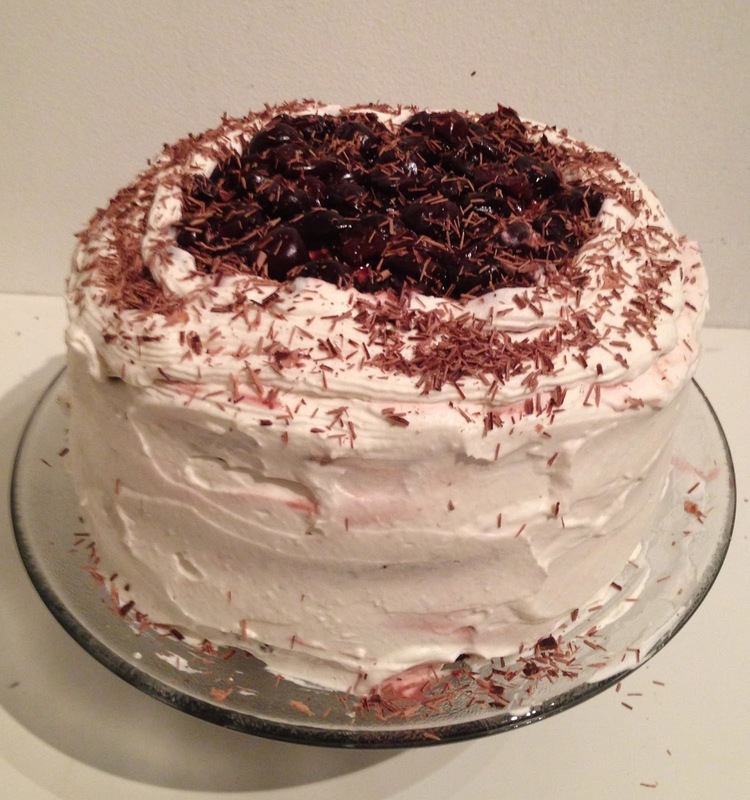 I was asked to make it for a birthday party, but all I knew was that it involved chocolate, cherries and alcohol. The Black Forest (Schwarzwälder) is the name of a mountain range and forest in Germany. Schwarzwälder Kirschtorte is "Black Forest Cake" in German. Good luck pronouncing that. 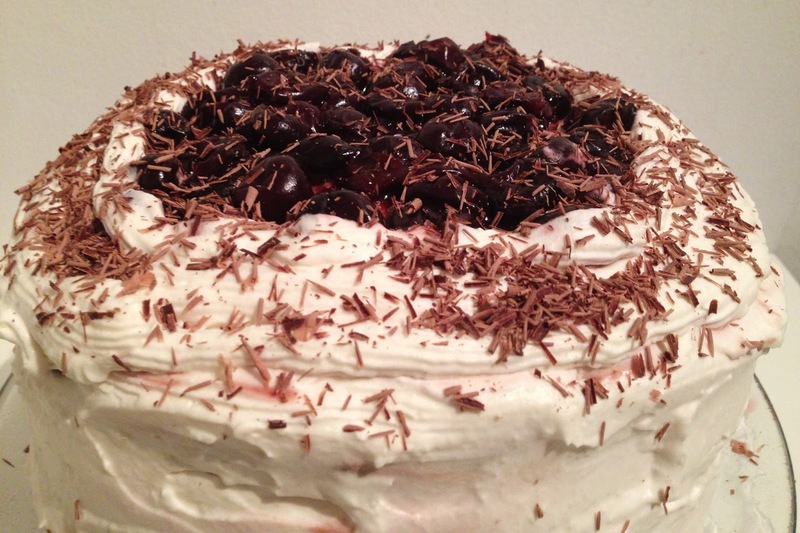 The Swedes make a Black Forest Cake with layers of meringue and chocolate and no cherries. Kirschwasser or kirsch is a flavored brandy made with sour cherries. 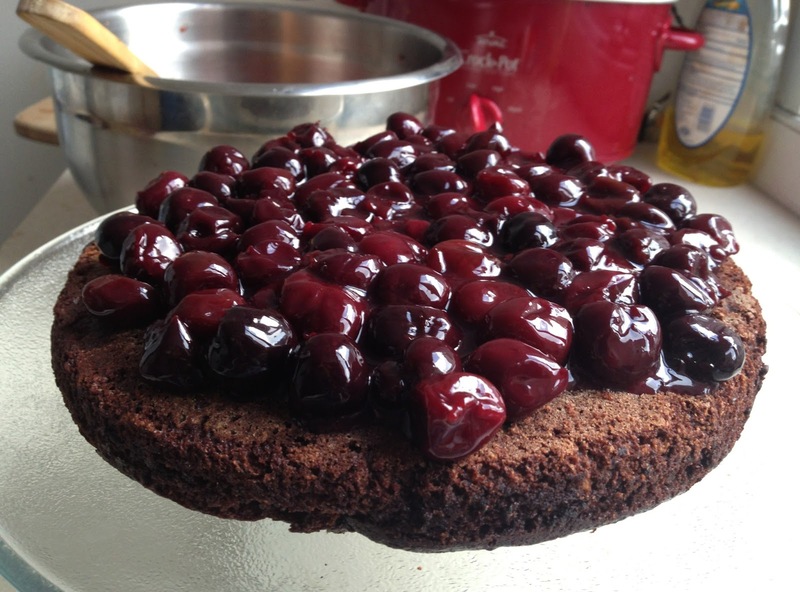 In Germany, Kirschwasser as a mandatory ingredient, otherwise the cake is legally not allowed to be marketed as Schwarzwälder Kirschtorte. My main take-away: It can be whatever I want it to be as long as there’s chocolate cake, cherries, whipped cream, and some sort of alcohol. Imagine it as a boozy Cherry Garcia sort of cake experience. Aka YES. 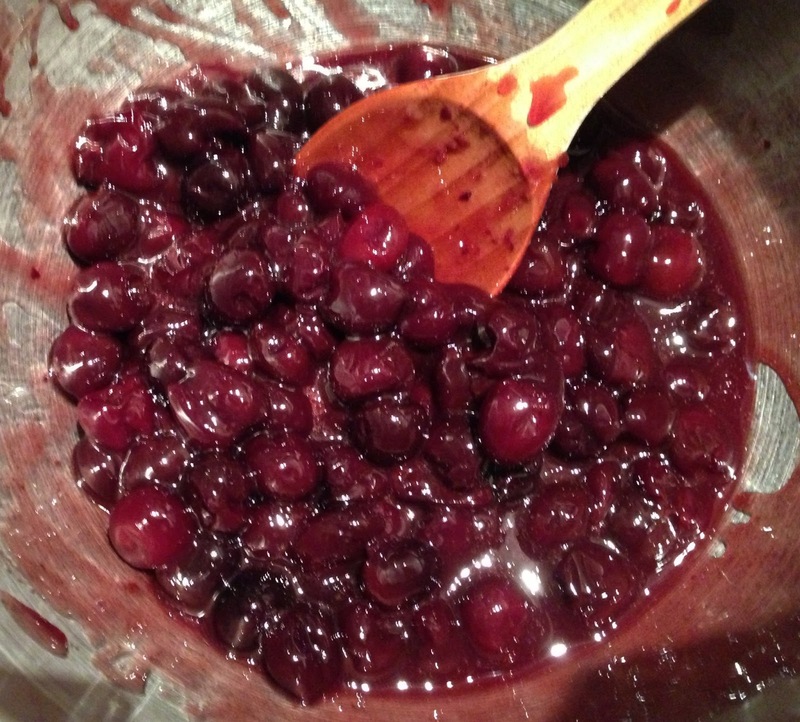 I made Martha Stewart’s Cherry Filling recipe. Black Forest is often seen with maraschino cherries, but this recipe uses frozen then thawed fresh cherries. YUM. I was unable to find kirsch, so I opted for the easy route and went with rum instead. I don’t think anyone was disappointed. The resulting cake definitely wasn’t as boozy-tasting as expected, so in the recipe below I’ve included some variations if you want a stronger alcohol flavor. Then I topped it all with Stabilized Whipped Cream Frosting. This recipe never gets old. This is the kind of cake that gets better the longer it sits. I made the cake layers and cherry filling last Thursday night, then post-Friday morning workout and pre-work I made the whipped cream frosting and assembled it all for the party Friday night. And clearly ate an inappropriate quantity of whipped cream pre-breakfast well duh. One major downside is that this cake did not cut nicely at all. The chocolate cake is super moist and delicious, but that means when you try to cut through whole cherries it all kind of goes to pieces. 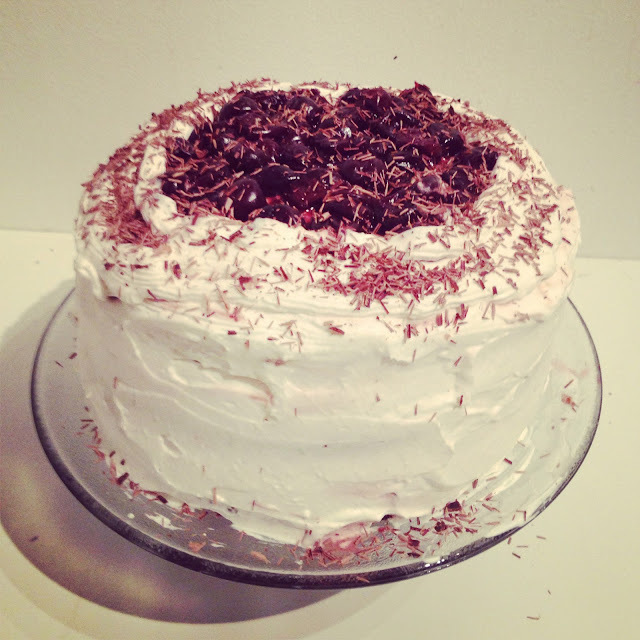 If you want a prettier-cutting cake, I suggest finding a more sponge cake-ish chocolate cake recipe. OR you could make it as a trifle. That would be AMAZING. Despite the messiness, I'd say the cake was a hit. A certain friend left the party before the birthday girl cut the cake. He expected there to be leftover cake saved for him...nada. Lessons to learn: Stay for the cake!!! In a medium bowl, whisk together the oil, water, rum vanilla extract and vinegar. Cool in the pan for 10 minutes then remove from pan and cool on a wire rack for 30 minutes. I recommend putting cakes in the freezer for an additional 30 minutes or in the fridge overnight before frosting the cake, it will make them easier to handle. Whisk reserved juice, sugar, rum/kirsch, and cornstarch in a small saucepan until smooth. Cook over medium heat, stirring constantly, until mixture is thick enough to coat the back of a spoon, about 8 minutes. Let syrup cool slightly. Combine syrup and cherries in a medium bowl. Refrigerate until ready to use, up to 2 days. Using a hand-mixer, beat until smooth. (If you accidentally let it get too firm in the fridge, just beat it for longer, it should loosen up). Add remaining cream and beat until it reaches whipped cream texture/thickness. 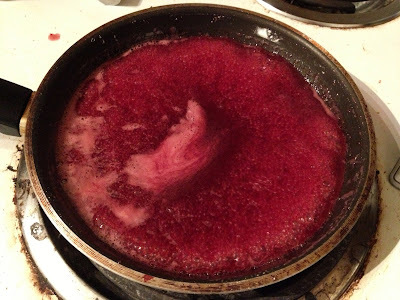 Add salt, sugar, vanilla (or rum or kirsch), and cream of tartar; beat in gelatin mixture. Spoon a little less than ½ the cherry mixture over the first layer of the cake. Use a piping bag to create a whipped cream wall (to keep the juice from running down the sides). 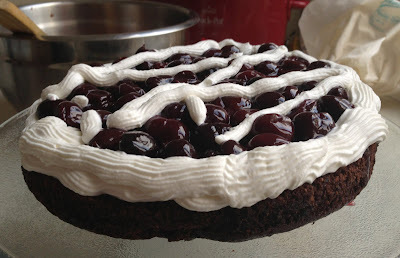 Spread a bit of whipped cream on top of the cherries. Place second layer on top and repeat. 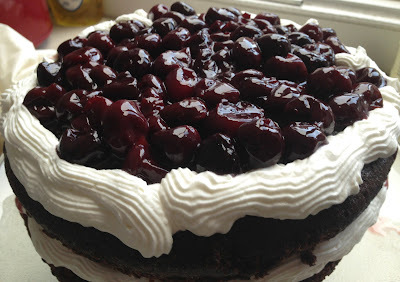 Add the last few cherries (about ¼ cup) to the top of the cake and frost generously with the rest of the whipped cream. Shave dark chocolate on top -- I just use a vegetable peeler.